>Over the next few days, most of the US will be blanketed by snow. The weather map on the evening news was a gorgeous riot of reds, purples and orange to announce the coming white-out. Instead of worrying about shoveling, I prefer to plan for a peaceful read on the couch, snuggled under a blanket with a good book. Under the Mercy Trees is the perfect book to snap up before the snow traps you indoors. 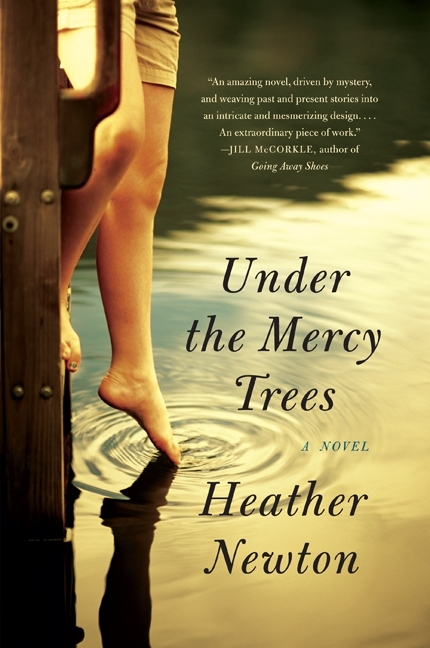 Heather Newton‘s lyrical and quintessentially Southern prose has been compared to the prose of eminent Southern writers including Pat Conroy and Carson McCullers. This is Newton’s first novel and she is full of promise. Her voice will charm you and transport you into another world. Our book club frowns on hardcovers, so you’ll be happy to know that this novel recently came out in paperback. Martin Owenby left the poetically-named Solace Fork, North Carolina to become a writer in New York City. Twenty years later, instead of being heralded as a successful writer, his life is filled with alcohol and easy men. When he is called back home to help find his missing brother, he must return to small town life and face a life of regrets. Some novels take ahold of you from the first page, haunting you with their desperately human characters. Under the Mercy Trees is one of those novels. The rhythm of Newton’s voice has lingered with me since I put it down, leaving me in a pseudo-daydream. It’s impossible to read Under the Mercy Trees and remain unaffected by Martin’s struggles. I recommend this powerful read for your book clubs or your snow days. This review is part of a TLC Book Tour. I received a review copy of Under the Mercy Trees to write this post. >I'm not quite snowbound but there IS a heck of a lot of snow and ice outside, and curling up with a good book sounds PERFECT right about now.